Cambodia’s tourism earned gross revenues of 4.35 billion U.S. dollars in 2018, up 19.8 percent from 3.63 billion dollars in a year earlier, Tourism Minister Thong Khon said here on Monday. Cambodia is in a state of flux. From textiles to tourism, the economy is growing fast. There is an emerging middle class and a burgeoning startup scene. The government is making progress in financial inclusion for rural unbanked. Thailand sent 34 Cambodians back to Battambang province on 25 February 2019 after they were detained by Thai immigration police in Chon Buri province. Police have detained more than 250 people on drug charges in a raid on a Phnom Penh nightclub owned by the brother of one of Cambodia’s richest men. Cambodia is experiencing a miraculous period of growth. The real estate is growing but is still far from a mature market. Thailand, on the other hand, is a powerhouse market in Southeast Asia. Real estate there is considered more stable. As the Kingdom anticipates population growth to reach 20 million by 2030, Prime Minister Hun Sen yesterday predicted that most citizens will eventually gravitate towards urban areas. Electricite du Cambodge (EDC), an electric utility in Cambodia, has launched an international tender for the implementation of a 60-MW solar photovoltaic (PV) project, with bids to be accepted by May 17, 2019. Singapore-based Nexus for Development has loaned social enterprise Khmer Water Supply Holding (KWSH) $500,000 to expand small-scale water infrastructure in rural Cambodia. The Royal Government of Cambodia always considers civil society organisations (CSOs) as its partners for social development. Cambodia and Viet Nam released joint statement following the state visit of high-level Vietnamese delegation led by His Excellency Mr. Nguyen Phu Trong, General Secretary of the Central Committee of the Communist Party of Viet Nam and President of the Socialist Republic of Viet Nam, to the Kingdom of Cambodia from 25 to 26 February 2019, according to the ministry of foreign affairs’ press release dated Tuesday. Some 10 people accused of bringing drugs and an illegal weapon into the Rock Entertainment Centre after the club was raided over the weekend are to be sent Phnom Penh Municipal Court, the chief of the capital’s police has said. The cases of a provincial military police officer and a soldier were sent to court yesterday as four other provincial military police officers were disciplined and made to write written statements accepting blame over the violent crackdown during a land dispute in Preah Sihanouk province last month. Cambodia-based food delivery and logistics platform Meal Temple has acquired Laos-based MyDelivery, a unit of fintech firm Kiwi Group. Prime Minister Hun Sen advised people on Monday not to be irrationally afraid of rabies to the extent of flocking to get vaccinated against the disease, and rendering institutions unable to provide timely services. Cambodia-based on-demand food delivery and logistics firm Meal Temple Group has acquired Laos-based MyDelivery, a unit of fintech firm Kiwi Group, according to an official release. At an event that gathered more than 10,000 workers in Kandal Province on 20 February 2019, Cambodian Prime Minister Hun Sen announced that all local and foreign investors are indiscriminately invited to invest in Cambodia under the roof of peace and liberal multi-party democracy. The current price of land in the province, is gradually gaining momentum as the region become one of the most attractive tourist areas. The president of the Federation of Indian Chambers of Commerce and Industry (FICCI) said India is considering expanding its investments in the Kingdom, particularly in science and technology, tourism infrastructure and manufacturing. Five Cambodian police officers and a soldier will be punished for their role in suppressing a land-rights protest on Jan. 24 in southwest Cambodia’s Sihanoukville province, with two cases already referred to the courts for action, a police spokesperson told reporters on Monday. The government of Japan has granted a total of $925,630 to two Japanese charities based in Kratie and Kampong Thom provinces for the completion of a paediatric surgical care system enhancement scheme and a cluster munitions project. The government announced plans yesterday to set up public WiFi networks in Phnom Penh, Siem Reap, Sihanoukville, and Battambang before 2023. Eight goldmines in O’Tron village in Kratie province’s Sambor district were filled in by a provincial sub-committee taskforce on Friday and Saturday as part of a crackdown on the illegal extraction of natural resources. The people and Royal Government of Cambodia is a part of Viet Nam’s growth, His Excellency Nguyen Phu Trong, General Secretary of the Central Committee of the Communist Party and President of the Socialist Republic of Viet Nam informed Cambodian National Assembly President Heng Samrin in a courtesy call on Tuesday. H.E. Nguyen Phu Trong, General Secretary of the Central Committee of the Communist Party and President of the Socialist Republic of Viet Nam​​ has encouraged the Cambodian and Vietnamese National Assemblies (NAs) to further foster their cooperation. More than 100 workers from the W&D factory gathered in front of Phnom Penh Municipal Court on Monday in a show of support for six representatives who are appealing the ruling over their dismissal. Cambodia and Vietnam today signed a number of documents to further strengthen relations and cooperation between both countries, with the latter providing $25 million in aid to expand Cambodia’s National Assembly building. The Australian government has donated $2.5 million to the Australia-Cambodia Cooperation for Equitable Sustainable Services (Access) – a three-year programme to help people with disabilities and prevent violence against women. About 600 families in Oddar Meanchey province’s Anglong Veng district have appealed to the Water Resources Ministry to build a reservoir due to lack of water for consumption during the dry season. Cambodian and Vietnamese leaders have agreed to use past relations and experience as a basis to expand the bilateral cooperation between the two neighbouring nations. Nearly 90 garment workers fainted at the Olive Apparel factory in the capital’s Por Sen Chey district on Monday after starting work for just about 30 minutes. Prime Minister Hun Sen yesterday called on the people not to panic over rabies and simply seek vaccination although they have not been bitten by infected dogs or cats. Cambodian Prime Minister Hun Sen, on Tuesday morning, called on all Cambodian people to join hands in tackling and preventing fake news, which he believed to cause social turmoils in the kingdom and beyond. Prime Minister Hun Sen’s official Facebook page was hacked on Monday, with analysts saying a post threatening to shut down the social media platform in Cambodia was designed to present him in a negative light. Mr. Chhin Senghuon, Deputy Governor of Preah Sihanouk province, received in Sihanoukville yesterday a visiting delegation of the Japanese Maritime Self-Defense Force (JMSDF) led by Captain Yoshiyuki NAKAGAMA, Commander of the Training Division 1. A panel of judges has selected the six cleanest cities in the country, which will go on to compete against other Asean cities in a ceremony that will be held in Brunei next year. 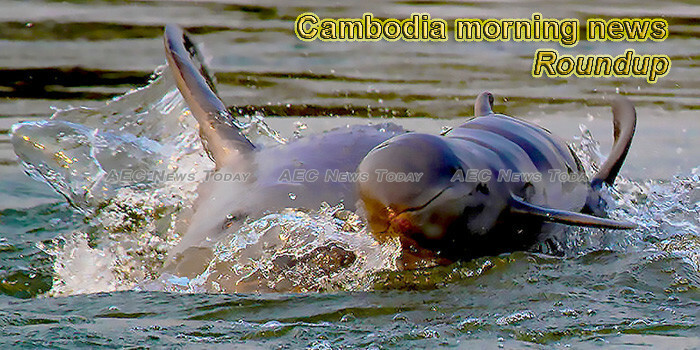 This week’s Cambodia morning news feature photo acknowledges World Wildlife Day, March 3.